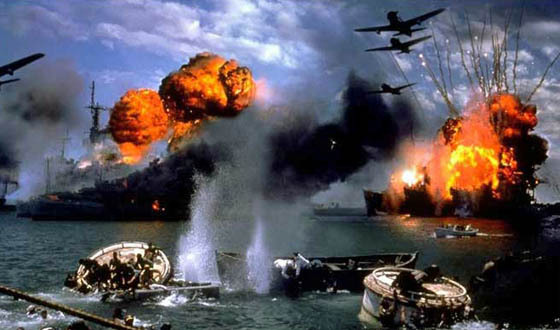 PEARL HARBOR snuck up with a stunning, moving preview teaser for its 2001 attack and got history and/or war movie fans revved up for something awesome, their appetites for big screen spectacle having been whetted by blockbusters Braveheart, Saving Private Ryan and Titanic, hits that plunged moviegoers into historical events on a scale and with an intensity that fans felt had been missing from the screen since the Epics heyday of the early 60s. Well, they got a spectacle for sure, but with all its $140,000,000 worth of CGI & full scale blasting the deadly duo of producer Jerry Bruckmeimer and director Michael Bay came up with a battleship-load of Craporama in terms of accuracy, anachronism, attitudes and artistic license. The 183 minute teeth-gritter is divided into a lengthy pre-war lead-in, the eye-filling attack, and then another hour to somehow give the corny romantic angle of the story a happy ending and the modern day audience some “USA !” to walk out of the theater with. Critics bombed the movie with nearly as much venom as the Zeroes that hit Hawaii back on December 7th, while veterans and history buffs were outraged by literally scores of errors, from incident and behavior to equipment and hairstyles. Randall Wallace, who did a fine job writing Braveheart, did his reputation no favor here, and most of the cast get as close to a 1941 feel as Honolulu is to Tokyo. On the positive side, the special effects are pretty stupendous, the color is gorgeous, and there are a great many individual shots that show beautiful composition or impressive gargantuan carnage, sometimes together. Even those put off by the flaws will acknowledge, at the very least, the incredible complexity of the action scenes. And face it–for people who’ve come of age since, say the 1980s–it’s sadly quite likely that they can’t locate the Pacific Ocean, let alone know (or care) about Pearl Harbor and that big argument we had with Mermany back when Lincoln wrote the Bill of Constitution. It was Oscar nominated for Sound, Visual Effects and Song, and won for Sound Editing. It made over $450,000,000 here and abroad. It stars Ben Affleck, Josh Hartnett, Kate Beckinsale, Cuba Gooding Jr. (laying it on thick), Tom Sizemore, Alec Baldwin (having retro fun as Jimmy Doolittle), Jon Voight (unrecognizable under makeup,and enjoying himself as FDR), Mako, Dan Ackroyd (awkward exposition to the fore) ,Colm Feore, Jennifer Garner, Michael Shannon. If you like this movie, and don’t know the history, you might want to be daring and pick up what we used to call–in the covered wagon days–a ‘book’: you might be surprised. Action fans will put up with the b.s to watch the combat.